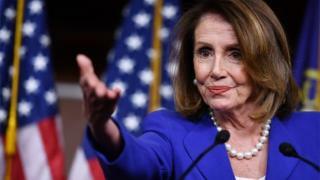 Image caption Nancy Pelosi: "People's space is important"
But he needs to understand that "people's space is important", the House of Representatives Speaker added. Four women have levelled accusations as Mr Biden ponders a run for the White House in 2020. Mr Biden has said he does not believe he has ever acted inappropriately. The latest came from Caitlyn Caruso, a 22-year-old former college student, and 59-year-old writer DJ Hill, the New York Times reports. Ms Caruso said that at an event three years ago Mr Biden rested his hand on her thigh "even as she squirmed in her seat to show her discomfort", the newspaper reports. Ms Caruso also said Mr Biden hugged her "just a little bit too long". Meanwhile, Mrs Hill said that at a fundraising event in 2012 Mr Biden put his hand on her shoulder and then started dropping it down her back, which made her "very uncomfortable", according to the New York Times. Mrs Hill also said her husband, who was nearby, then had to interfere. On Monday Amy Lappos, a 43-year-old former aide to a Democratic congressman, said Mr Biden touched her inappropriately at a fundraiser in the town of Greenwich, Connecticut, in 2009. She told the Hartford Courant the then vice-president entered the kitchen to thank a group of aides, before wrapping both hands around her face and pulling her in to rub noses. Last week, Lucy Flores said Mr Biden had placed two hands on her shoulders from behind, smelled her hair then planted "a big slow kiss on the back of my head" at a campaign event. That was when she was running as the Democratic candidate for Nevada's lieutenant governor in 2014. Mr Biden had flown in to support her bid and the incident is alleged to have happened as she prepared to go on stage. Ms Flores, too, has said - in an interview with the Huffington Post - that such behaviour is "disqualifying" for a presidential run. Her allegations first appeared on Friday in an article she wrote for The Cut magazine. Nancy Pelosi, who leads Democrats in the House, made her views known to Politico. "I don't think it's disqualifying," she said of his as yet unannounced presidential bid. "Join the straight-arm club," she said, suggesting that he keep to handshakes only. "Just pretend you have a cold and I have a cold," Ms Pelosi added. Senator Elizabeth Warren, a Democrat who has declared she will try for the nomination, said Mr Biden "needs to give an answer". Another leading Democratic Party presidential contender, Senator Amy Klobuchar said that in politics "people raise issues and they have to address them". 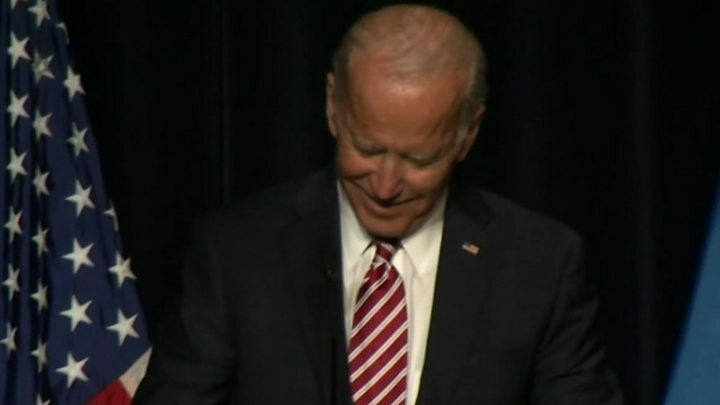 An ally of Mr Biden told CNN the former vice-president was not reconsidering any run for the White House following the allegations but stressed he had yet to make a decision. The former Delaware senator, who served as Barack Obama's vice-president from 2009 to 2017, is seen as a possible front-runner in the race for the Democratic nomination. He issued a statement on Sunday, saying: "In my many years on the campaign trail and in public life, I have offered countless handshakes, hugs, expressions of affection, support and comfort. And not once - never - did I believe I acted inappropriately." For his vice-president's birthday in 2017, Mr Obama posted a photo of the two of them on Twitter, writing that Mr Biden was his "brother and the best vice-president anybody could have".